Whether you’re into travelling, wine, doodling or fashion. Moleskine has a journal for you. 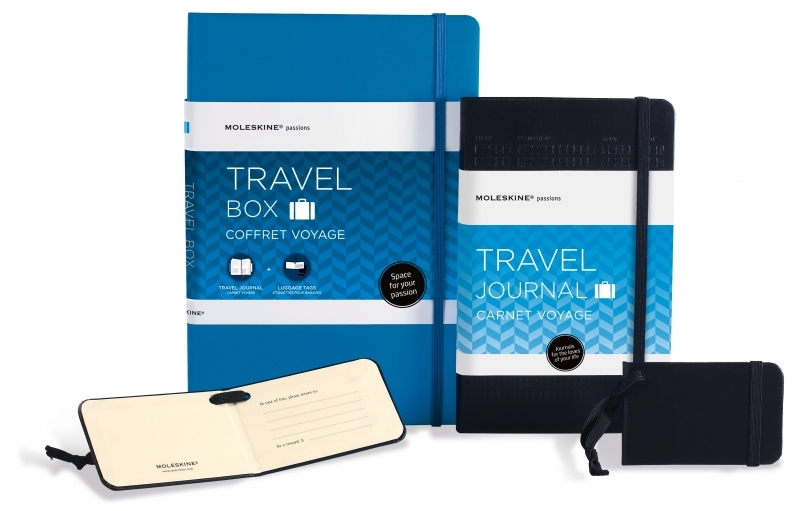 How about this cool travel journal including luggage tags? Not for you? Then you can always choose a neutral Moleskine journal. Don’t we all recognise the chique white star logo of Montblanc? Pens, wallets, notebooks. Their stationery is popular all over the world. The Montblanc notebook is classy, sophisticated and lasts a life time. I’m hoping they will make one in orange! Busy bees don’t go anywhere without their Filofax. The smartest Filofax has room for your tablet, smartphone, pens, business cards and a writing pad. How is that for an organised situation? This budget note pad comes in all colours, sizes and prices. Do you want your journal lined? Choose a cover with a cultural heritage reference or pick a neutral appearance. Paperblanks also offers agenda’s, day planners, address books and boxes. Oh, you pretty little things! With this writing case from Fred de la Bretonière your meeting is a succes before it even started. Which one is your favourite? Dark brown, black or camel? It was fun meeting all of you people in 2013. I hope to see you again this year. Check my event schedule for 2014 and pay me a vist in Frankfurt, Orlando, London, Vegas or Barcelona. 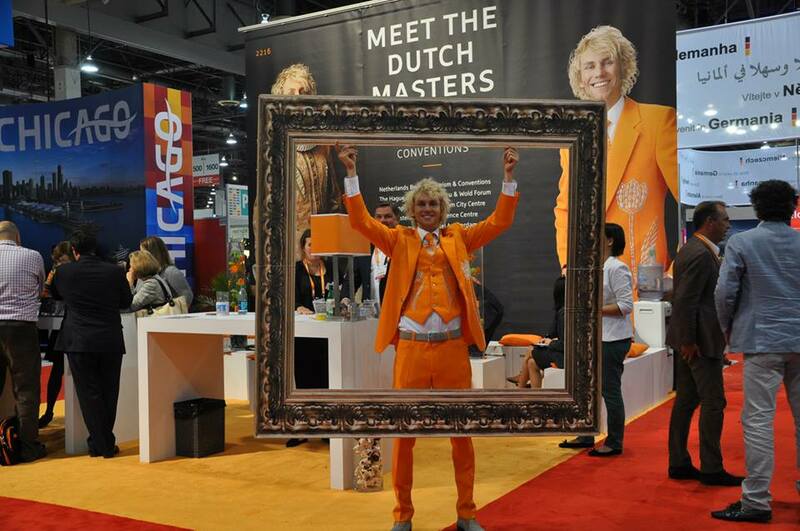 I am happy to welcome you at the Holland Meeting Point. 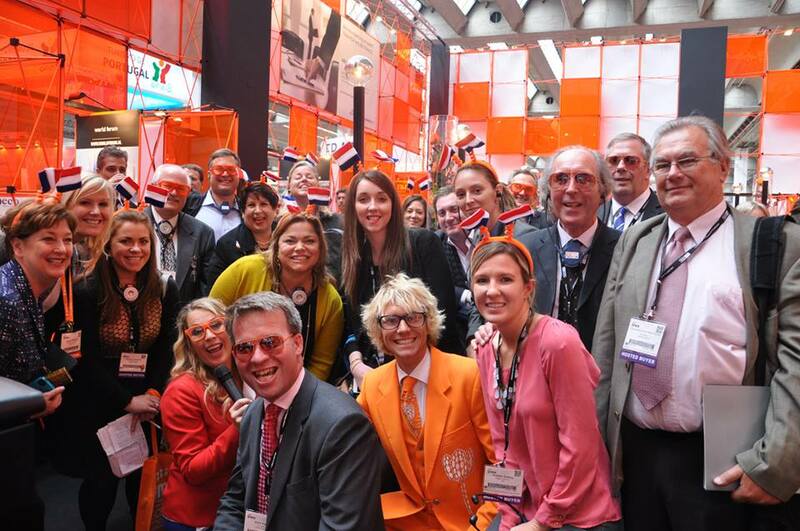 Experience Dutch hospitality and get in touch with my Dutch partners. 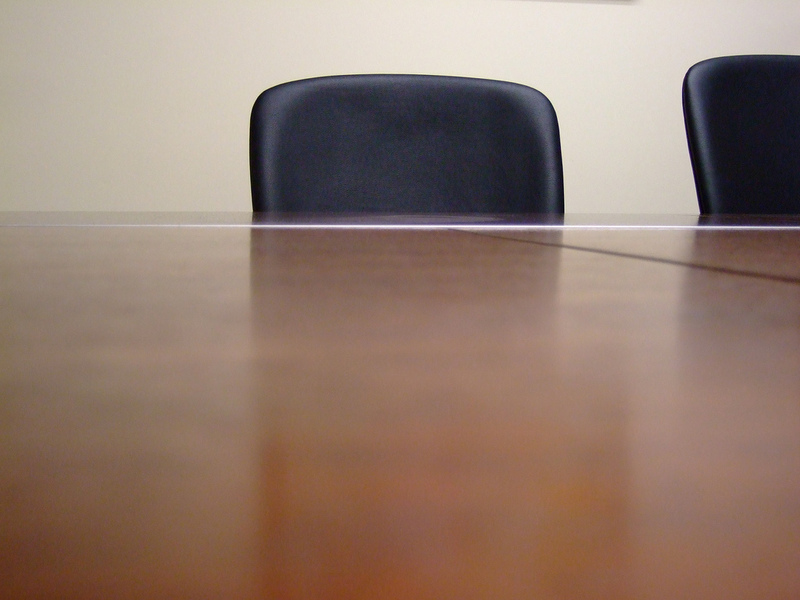 I can help you to find the right match for your own meetings. Whether you are from an agency, are a corporate or association buyer, organise events as part of your business travel or marketing remit – at IMEX all important players of the meeting industry come together. In times of economic change IMEX might offer you inspirational answers to critical questions within the meeting industry. The Americas Incentive, Business Travel & Meetings Exhibition (AIBTM) is a leading global exhibition for the U.S. meetings and events industry. AIBTM delivers individually qualified Hosted Buyers and eligible Trade buyers from the U.S. and around the world. 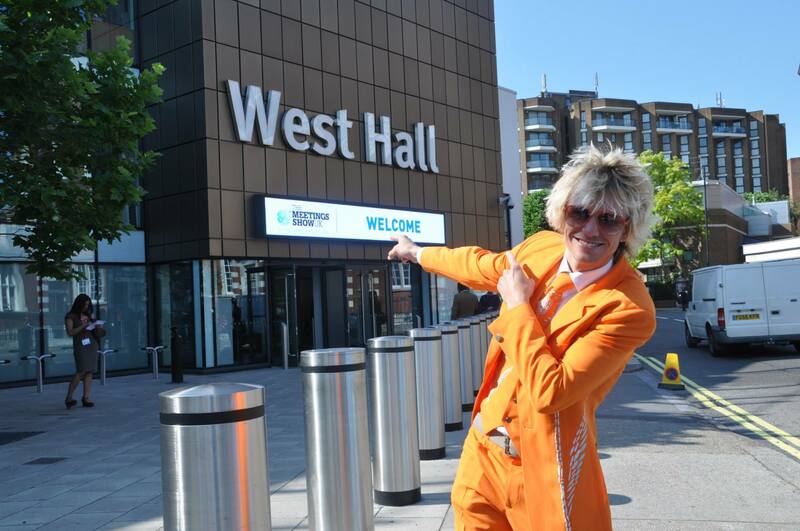 The Meetings Show UK is a major new event for the UK meeting industry offering an unrivalled platform of inbound and outbound business and bringing together the heart of the meetings community. The hosted buyer programme will identify influential buyers, the education programme will be devised by a panel of leading industry figures. We can expect interesting content and great networking opportunities. 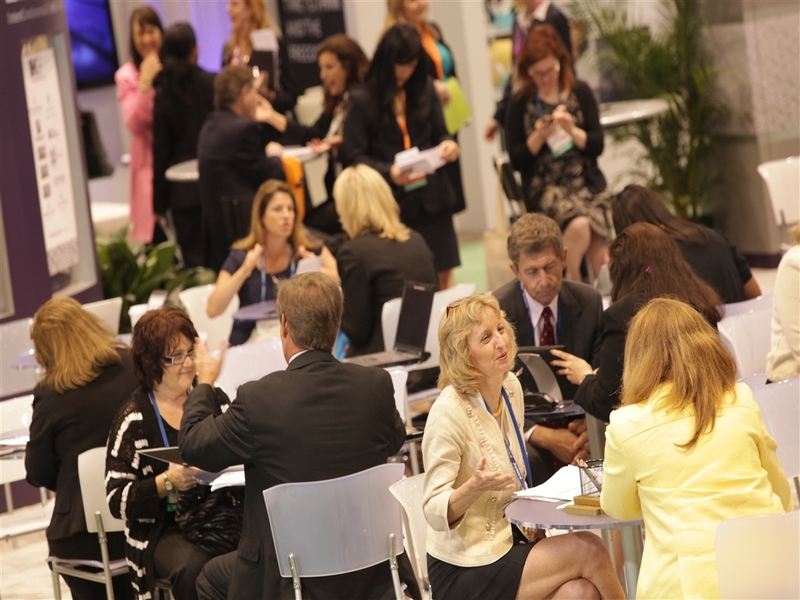 IMEX America is America’s worldwide exhibition for incentive travel, meetings and events, backed by the experience and resources of the IMEX Group of exhibitions. The show runs the largest hosted buyer program ever held in North America with over 2,400 qualified buyers, including convention and visitor bureaus, national and regional tourist offices, major hotel groups, airlines, destination management companies, service providers, trade associations and more. EIBTM is the leading international event in the European meetings and incentives industry and provides a valuable networking and business forum. 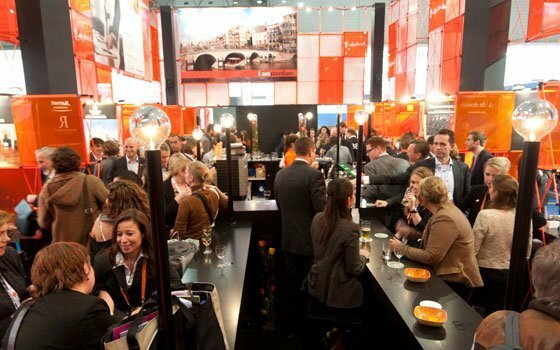 On average, EIBTM attracts 5,000 industry buyers of which over 2,000 are top level decision makers bought to the event as part of its Hosted Buyer Programme. For anyone organising events, conferences or business travel, EIBTM allows them to meet over 2,500 exhibitors under one roof. …which of these events are you planning to attend this year? Holland is not particularly famous for their kitchen. But.. we do have some great foods you should try during your next visit! Will you let me know which one you liked most? Meat ragout balls covered in breadcrumbs, usually served with mustard. These snacks are served at formal and informal parties. You can order them almost everywhere! At a terrace, bar, snack bar or restaurant. Dutch people love their cheese. We are famous for dairy products and especially for cheeses. 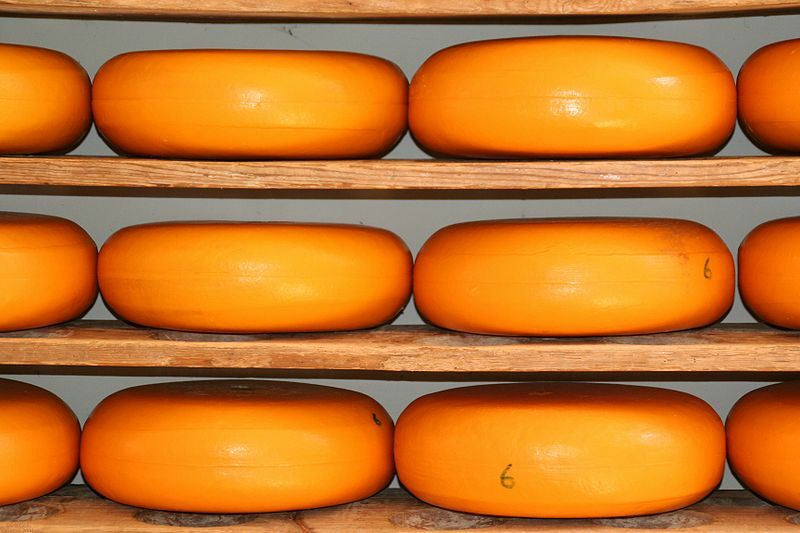 The vast majority of Dutch cheeses are semi-hard or hard cheeses. There’s a lot of choice. You can go for a neutral cheese or try a blend with herbs or spices. How about a cheese with cloves (usually the Frisian nagelkaas), cumin (most famously Leyden cheese), or nettles? Curly kale mixed with potatoes, served with gravy, mustard, and rookworst sausage. How does that sound for dinner? 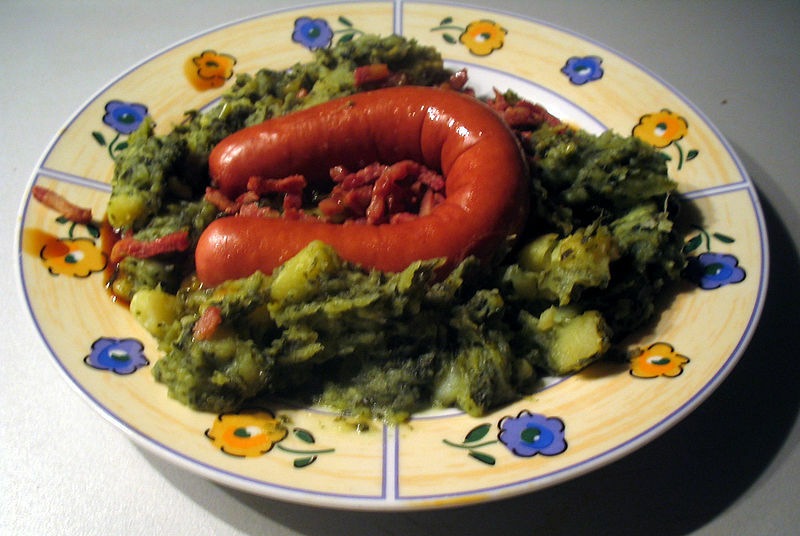 It is one of the oldest and most popular Dutch dishes. Boerenkool is high in carbohydrates, which makes it a popular meal for cold winter days. 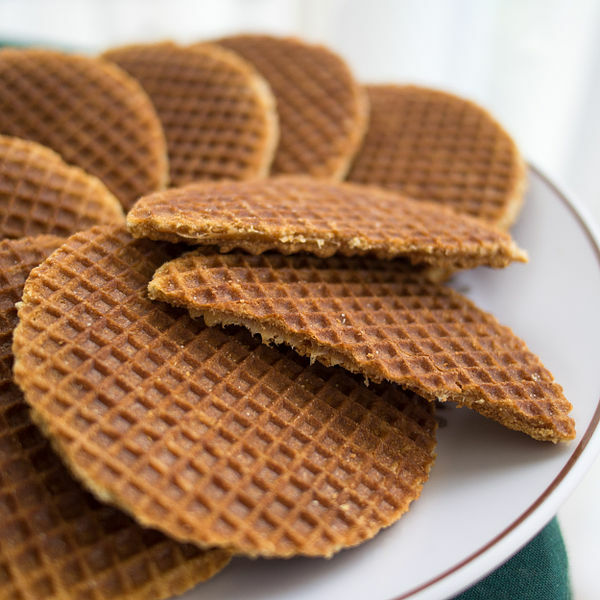 A true Dutch treat is the stroopwafel or caramel/syrup waffle. A thin wafer, made typically in a pizelle pan, sliced horizontally and used for sandwiching a layer of light caramel syrup. And yes, it tastes even better than it sounds! You either love it or hate it! This famous Dutch sweet comes in all sizes and flavours. The four types of drop are soft sweet, soft salt, hard sweet and hard salt drop. 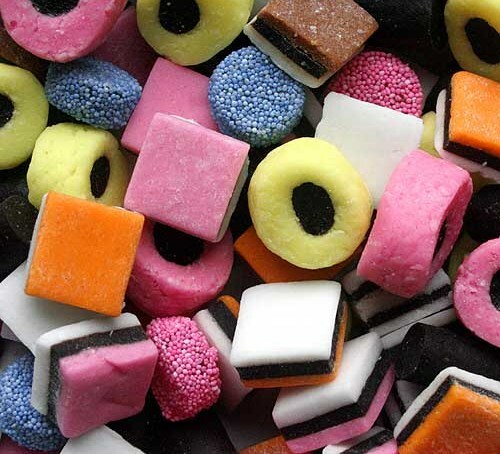 When they are flavored with coconut fondant they are called English liquorice. Other varieties are made with honey, mint, salammoniac, or laurel (laurierdrop). Typical shapes are diamonds, ovals, oblongs and as coins. A quite new addition to Dutch fast food is the kapsalon, translated barbershop, consisting of either shawarma or döner, and with fries, salad, cheese and various sauces, all put into one take-out box. 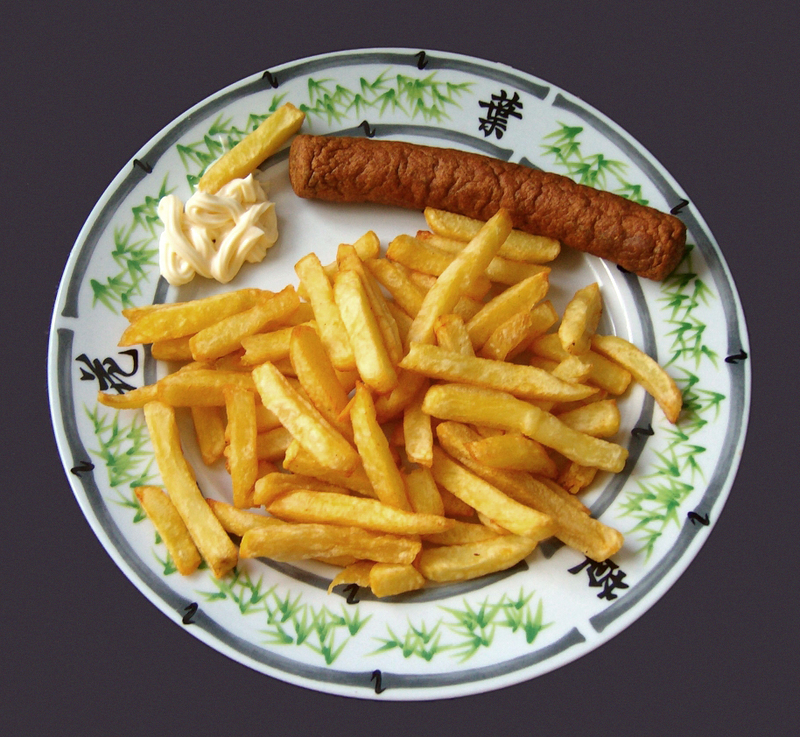 It was named after the barbershop in Rotterdam that ordered this combination of foods as a lunch. 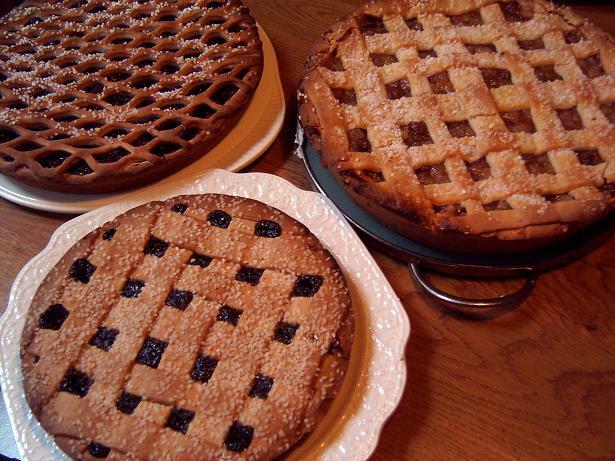 Vlaai or Limburgse vlaai is a pie or tart consisting of a pastry and filling. Vlaai is usually 27—30 centimeters in diameter. It is available in many different varieties of fruit fillings, such as cherry, apricot, strawberries, and plums. They are often eaten on life events, such as birthdays and funerals. 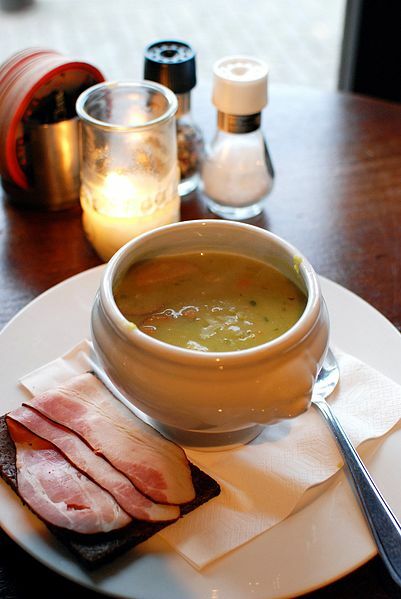 Erwtensoep, also called Snert, is a very thick pea soup that can be served either as a main dish or as an appetizer and is traditionally eaten during the winter and especially during ice skating. It is customarily served with rye bread spread with butter and topped with katenspek, a variety of bacon which is first cooked and then smoked. The meat from the soup may also be put on the rye bread and eaten with mustard. The new herring season starts in June this year. What can you expect? 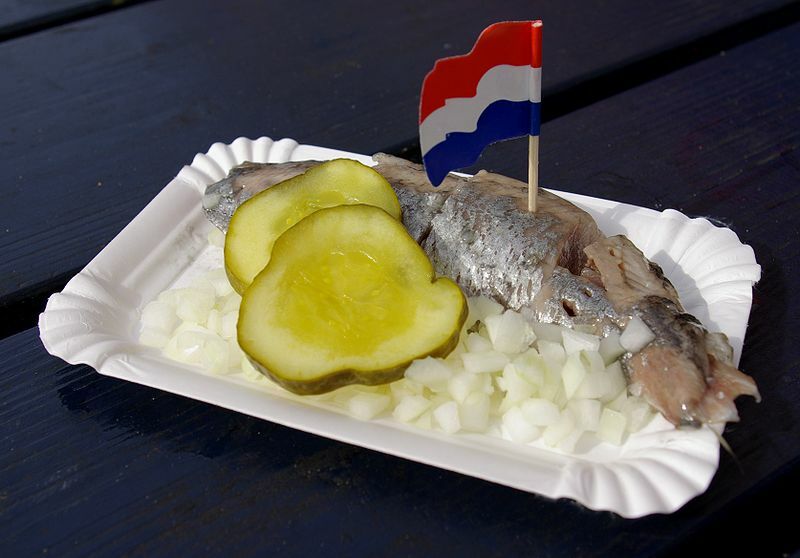 Raw herring (called Hollandse nieuwe / Dutch new), optionally served together with chopped raw onions and gherkins. People eat it in a special way; lifting the herring high up into the air by its tail, and then biting into it upwards. Do not eat the little Dutch flag. 😉 Raw herring is also commonly sold in a soft white bun. A Dutch fast food meal often consists of a portion of French fries with a sauce and a meat product. The most common sauce to accompany French fries is mayonnaise while others can be ketchup or hot peanut sauce. 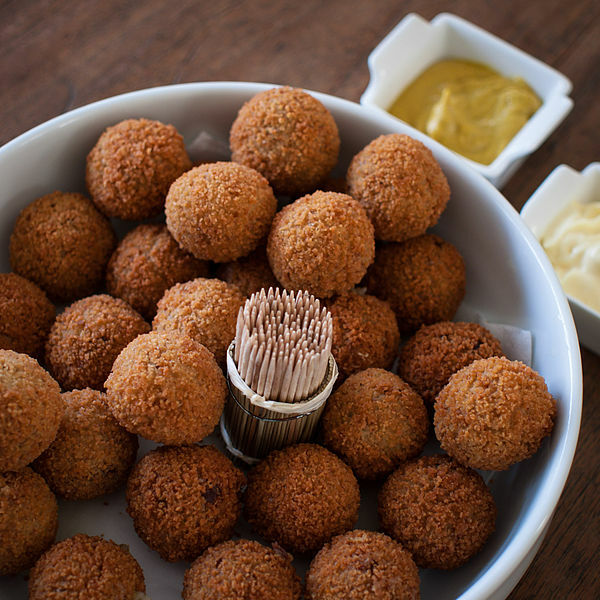 Snacks made with meat are usually deep fried, this includes the frikandel (a skinless minced meat sausage). Dip it in the peanut sauce, you’ll love it! 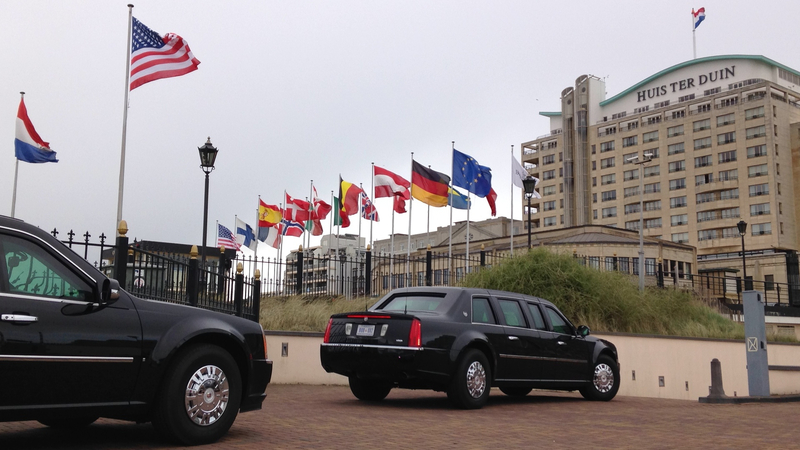 Last March, during the Nuclear Security Summit, President Obama chose to stay at Grand Hotel Huis ter Duin in Noordwijk. How exciting for a hotel manager. I talked to commercial director Stephan Stokkermans about this very special guest. The Grand Hotel Huis ter Duin was chosen to be the residence of the U.S. President during the NSS. How did this decision come about? The organisation of the NSS was in the hands of the Dutch government in general and the ministry of foreign affairs in particular. They booked approximately 8,000 rooms for all delegations. The embassy of America explicitly picked the Grand Hotel Huis ter Duin based on location, capacity and quality of the rooms and halls. How much preparation time did it cost from the beginning to the actual visit? During the first quarter of 2013 the ​​selection of hotels was made. From September on we drafted plans along with the embassy and the White House. Did President Obama comment on his stay at Huis ter Duin? 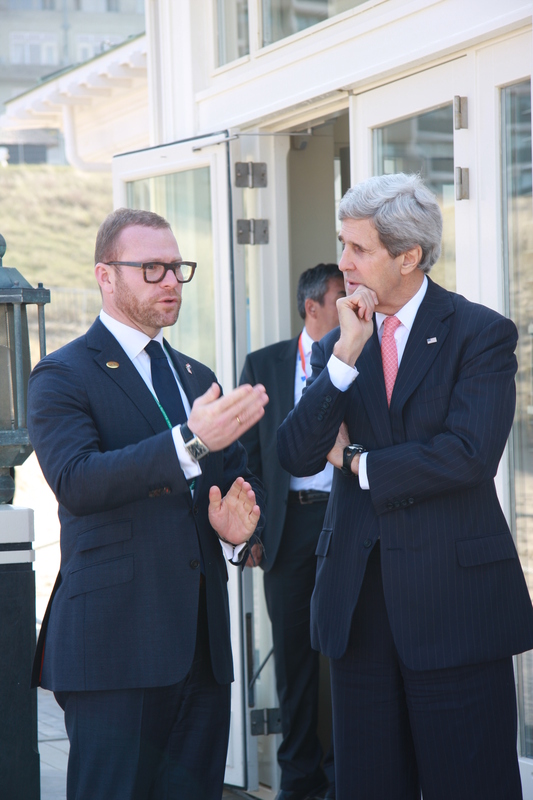 Both President Obama and state secretary Kerry were very enthusiastic about the hotel. In particular, they found the facilities and location to be very impressive. In fact, the seaside setting reminded them of Cape Cod. What are the differences between hosting a delegation and “any other group”? The Grand Hotel Huis ter Duin has a rich history hosting international meetings of multinationals, the European Union and NATO. Those meetings are attended by several delegations and they come with an extensive conference program. In this situation, the focus is on the temporary residence of a head of state and his support services. Which was reassuring, but given the importance of the delegation we did feel a serious amount of pressure. What were the biggest changes you had to make for safety or comfort? The greatest challenge was to create additional offices for support services for the White House. Next to that there were, of course, additional security measures taken by the Dutch government to ensure the safety of the American delegation. What kind of food did you serve President Obama? One of the fun parts was the initiative of our chef Marcel van Lier, awarded with a Michelin star, to serve some exciting amuses with a typically Dutch touch. Each and every event inspires us to continue to improve our services and facilities. One of the enduring improvements we have made was definitely the ICT structure of the hotel so we can better respond to requests from large numbers of users. If you could choose one famous person you would like to welcome to your hotel in the future, who would that person be? For sure, welcoming none other than the President of the United States is a highpoint for every hotelier. We feel even more connected with the United States through our membership of Preferred Hotels & Resorts. However, regardless of which guest we welcome or whatever their positions or nationalities may be, we’d be determined to exceed expectations. Whether you are travelling to another province or abroad for a product launch, brainstorm session or business meeting with foreign offices, it is always smart to be well prepared. I have collected a few tips for you! Even if you are not an active participant in the event like a speaker or decider, it is recommended you know the ins and outs of the subject. As a representative of the company you should be able to answer questions to those who are new to your company or to the subject. How can this place inspire this meeting? Before the meeting takes place, think about why this venue or location was chosen. Is it different than usual? How? Is it conservative, formal/informal, green, hybrid? It probably isn’t a coincidence, it partly reflects on how the management sees the current activities or how they want them to be. Then, think about how this setting can inspire your meeting. Could you learn from the KPI’s of the venue? How could you translate the look & feel as inspiration for your business meeting? Being away from the office gives you the opportunity to work different than usual. Try to take this advantage with you during your business meeting. Why not have a brainstorm session with colleagues from a different department or higher/lower position? Step away from PowerPoints and use whiteboards and markers. A different way of working, usually leads to different and innovative solutions. It is (most of the time) highly appreciated when you bring something extra to the table. Come up with a new idea to market a product, how to reduce costs in the office or how to work more efficiently from home. To make sure there is time to discuss your ‘little extra’ you should probably announce your idea to the person that is in charge of the program. Now I’m curious about you. How do you prepare for a business trip? Leave your tips, suggestions and experiences in the comments! Travelling for business reasons can be great. You get to go to places you’ve never been before and experience all kinds of different cultures, foods and climates. But there are a few unwritten rules you should keep in mind. I collected a few do’s and don’ts about business travel etiquette for you. I’m curious about your travel tips. Will you leave them in the comments? There’s nothing more annoying than bringing the wrong kind of creditcard, clothes or business information. Prepare in advance. Should you bring a VISA or MasterCard? What season is it at my destination? Which language do the people speak? Asking yourself these simple questions can avoid a lot of problems. People in other countries have a different cultural context. Words, but also hand gestures can have a total different meaning then you’re used to. Going for business abroad usually means eating and drinking with local people. Read up about food etiquette before you go to dinner. It shows respect for the local culture and makes for a great conversation starter. Travelling with fellow colleagues can be a lot more fun than travelling solo. But being around each other for a longer period of time could lead to irritation. This can be easily avoided by respecting the privacy of others. When people sleep during the flight, leave them. When they look like they want to be left alone, they probably want to be left alone. Giving each other space will make your trip a lot more relaxed! Even when you find yourself on a white beach with a beautiful sunset, keep in mind why you are here. It is not a vacation. You are here for work reasons. Of course business can be mixed with pleasure, but keep it neat. Don’t drink too much, don’t get too informal with your colleagues and respect people and things around you. 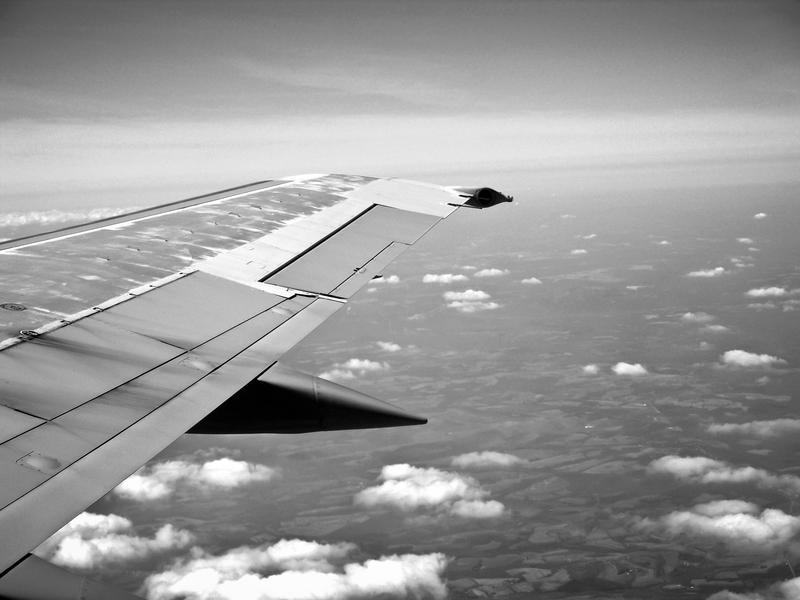 What are your favourite business travel tips? Will you leave them in the comments?